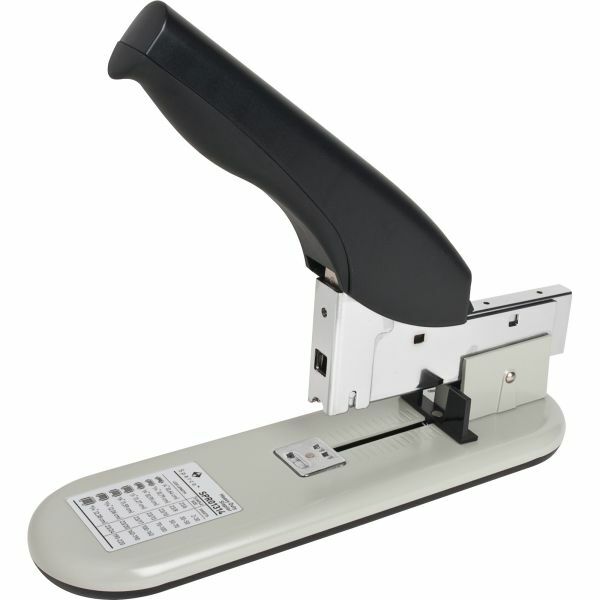 Sparco Nonskid Base Heavy-Duty Stapler - Heavy-duty stapler uses various sized staples to fasten 30 to 210 sheets. Design includes steel construction, nonskid rubber base and an adjustable throat-depth guide. Throat depth measures 2. Using the 1/4" staple will fasten 30 sheets of 16 lb. paper. A 5/16" staple fastens 50 sheets. A 3/8" staple fastens 70 sheets. A 1/2" staple fastens 100 sheets. A 9/16" staple fastens 120 sheets. A 5/8" staple fastens 140 sheets. A 13/16" staple fastens 170 sheets. A 7/8" staple fastens 200 sheets, and a 15/16" staple fastens up to 220 sheets." 1/4" 3/8" 1/2" 9/16" 5/8" 3/4" 15/16" 13/16" 5/16" 7/8"